As you all know twitter had a feature which allows you to schedule your tweets but what about WhatsApp what to do if you want to schedule WhatsApp messages on Android? WhatsApp is the most popular messaging service on android with many advanced features, But WhatsApp currently doesn’t have a scheduling feature. So here we are presenting the best methods to schedule the WhatsApp messages on your android phone. The WhatsApp scheduling option is easily available on the rooted android phone, But if you don’t want to root your android phone for scheduling the WhatsApp messages, then the methods below definitely works for you. This method helps you to schedule single or group messages on a particular date or time of your choice. 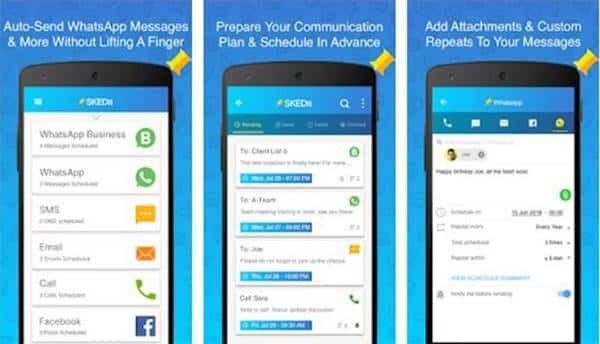 SKEDit is a popular scheduling app that lets you schedule your WhatsApp messages, SMS, schedule posts, email later, and call reminders. This application work like your personal assistant. Step 1: Firstly download the skedit application on the android phone. Step 2: Open the application and skip the introduction after that you find the “done” message just tap on it. Step 3: Now you find the login screen just create a new account or login with your Facebook account. Step 4: Skedit is now shown you all the services that supported by the application just select the WhatsApp and hit the done button. Step 5: Now prompt ask you to grant permission to access contacts just tap the “allow” button to continue. 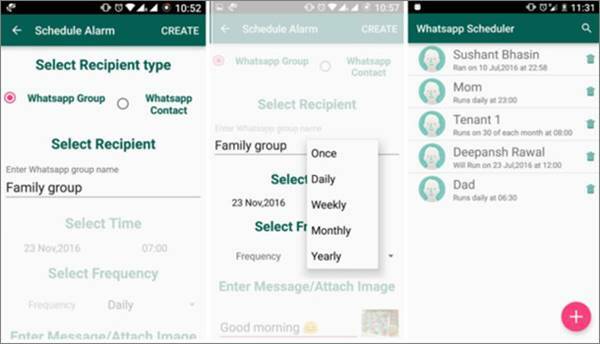 Step 6: Select the time and date schedule for the WhatsApp message. Step 7: Once all the task completed then hit the “send” button. Step 8: At end choose the contacts whom you want to send the scheduled messages. 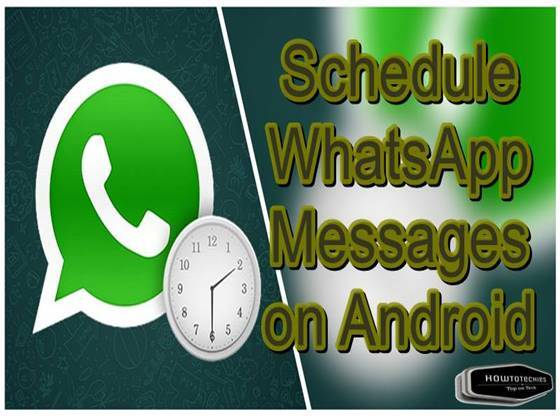 Step 1: First of all, download the Scheduler for WhatsApp App on your Android smartphone. Step 2: Now install the application on your smartphone and give the accessibility when prompt ask you. Step 3: Open the app and click on the ‘+’ icon to create a new schedule. Step 4: Now select the recipient to which you want to send the message. After that select the time and frequency of the schedule. Step 5: Once you are done you can easily find the Scheduled task on the home screen of “Scheduler for WhatsApp”. That’s done now enjoy the free scheduling with the scheduler for WhatsApp. So here we show the two best methods for scheduling WhatsApp messages. These are helpful if you want to recall something at a specific time. Now friends if you are having any trouble relating to scheduling of your WhatsApp messages, then comment below for any query and suggestion.